Here’s an interesting article and some food for thought. An Australian study – which was published in BMC Pregancy and Childbirth and is thus freely available if you’d like to read it in full for yourself – explored midwives’ experiences and views of the role of obstetric ultrasound, with a focus on where this is used in complicated pregancies and in situations where maternal and fetal health interests conflict. Now let me just pause for a moment and say that, if you’re wondering about the definitions of ‘complicated pregnancy’ and ‘situations where maternal and fetal health interests conflict’ and are thinking that those areas are ripe for debate, then so am I. This is part of a wider study and the authors note that participants raised and discussed other aspects of this topic area, for instance the use of ultrasound in early pregnancy screening. Other interesting features and noted limitations of the study include that a third of the midwives interviewed had training in undertaking ultrasound examination and participants all worked in tertiary referral hospitals. The authors described these as “highly specialised and intervention-rich environments”. “Overall, ultrasound was seen as having many advantages in maternity care; however, it was also seen as contributing to increased medicalisation of pregnancy, to complex and sometimes uncertain decision-making and to parental anxiety. The use of routine ultrasound was described as normalised and unquestioned in health care and in wider society. Midwives were concerned that this impacts negatively on informed consent processes, and at a societal level, to threaten acceptance of human variation and disability. Further, the use of ultrasound was seen to have led to increased ‘personification’ of the fetus, though a variety of views were expressed about when the fetus ‘becomes a person’. Protection of maternal health was the first priority for midwives, but they felt that women often put fetal health interests ahead of their own.” (Edvardsson et al 2015). having experienced anxiety as a result of US scans, I would welcome much further discussion of its use. I also know of a family member who kept their pregnancy a secret from most of the rest of us as they were told the baby had Downs and a heart condition. It was born perfectly healthy at 8lb and with no complications. It was by all accounts a horrendous experience for the parents. Much further discussion is required. Thank you. A very interesting read. 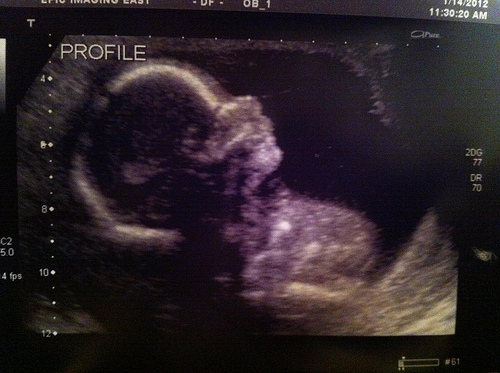 As a very anxious (due to previous miscarriage) pregnant lady myself once, my US scans enabled me to bond with my baby and allowed me to sleep at night. Knowing that he was growing well kept me going. I do however agree that when errors are made in US scans, the consequences for the parents can be devastating. This is definitely a subject which needs further discussion. Perhaps something that could be optional without the worry of being penalized for not attending appointments if you are afraid that it might have a negative impact on your pregnancy.